Brandon takes a very different look at the beef industry. He looks at it from the consumer perspective, rather than from the production side. He is wrapped, quite literally, in discarded brown paper bags which have been branded with a variety of recognisable beef related brands. These brands include both traditionally styled brands and product related brands. A coil of connected receipts spiral around Brandon from head to tail, and convey consumer loyalty to repurchase quality Australian beef. They show the time, love and money that the Australian consumer spends on beef each week. Brandon is simple and concise with a sophisticated message. 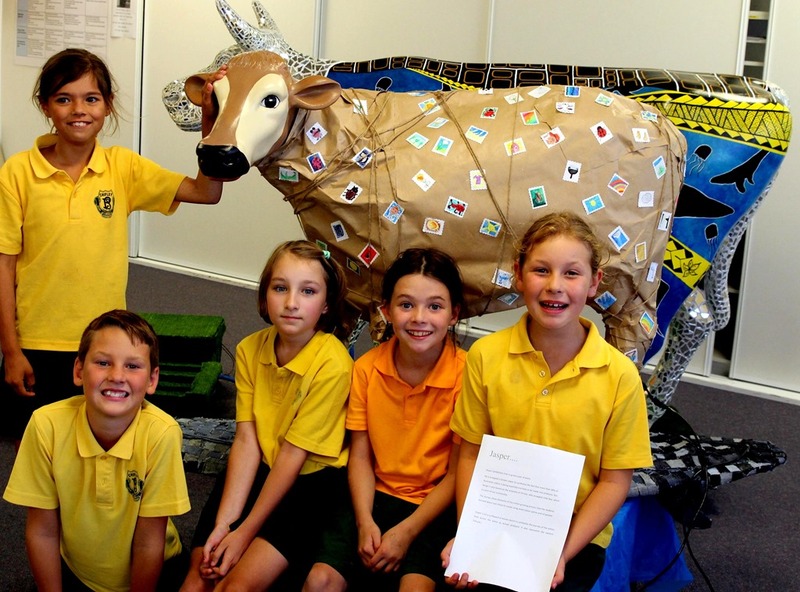 Where would our Archibull Prize competition be without a Hipster Cow? We haven’t had one in the past, but now we do! The concept is centred around urban youth culture. The cow has been painted to resemble a graffiti wall with cement rendering chipping away to reveal the brickwork below. Graffiti tags adorn the wall making links to the digital world of youth culture with QR codes to lead the audience to online information on wool through posts, tweets and Instagram photos. 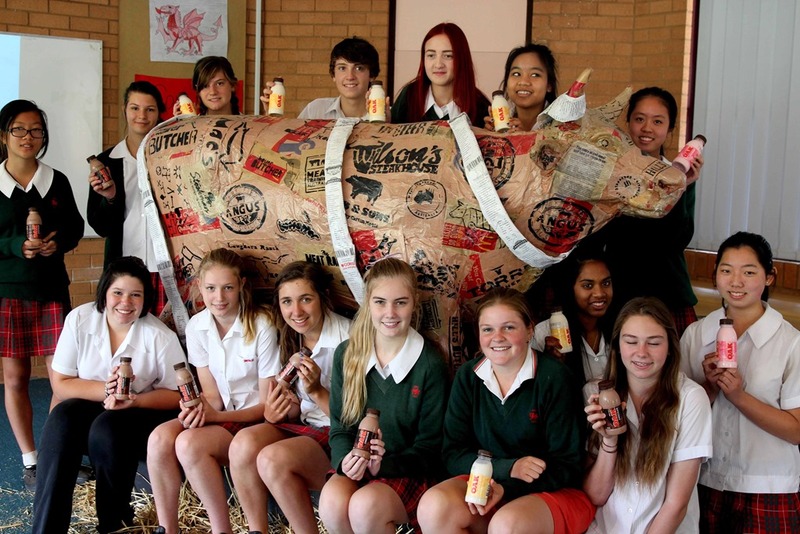 The handle @hipstercow13 and hash tag (#hipstercow13) that has been used in our social media will continue to grow as people snap it, tag it, post it and re-post it, increasing the online profile of the cow. Stencil art on the wall depicts a sheep blowing up piles of yarn to depict yarn-bombing. While the hipsters discuss their use of wool, the cow takes on the appearance of a hipster itself. He is wearing a school sock (the most common item of woollen clothing owned by students according to their survey) and a scarf in the colours of the school uniform. A very well dressed hipster cow! 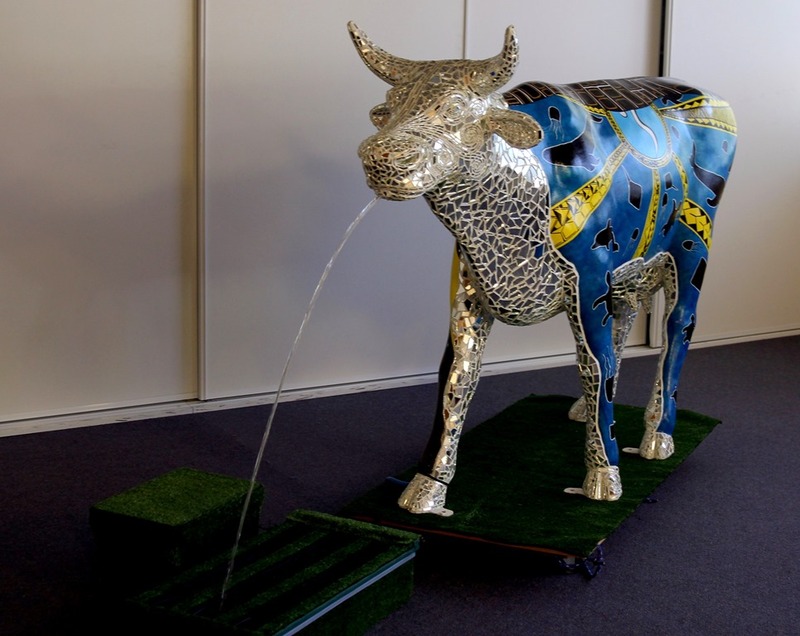 Jasper Co Co is the second of our very cool surfie cows, but tells a very different story. 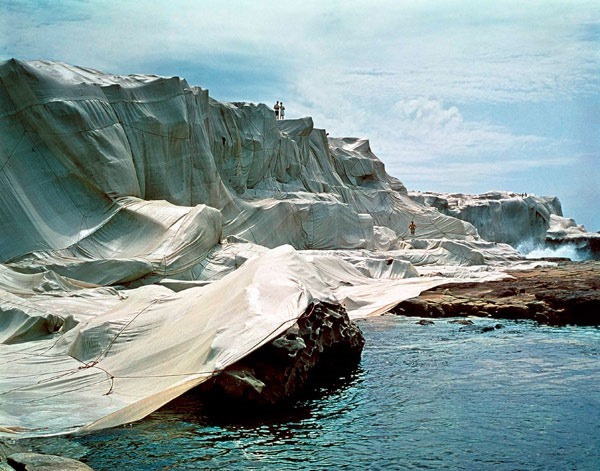 Jasper is channelling Christo (the artist who wrapped nearby Little Bay). He is packaged up to represent the fact that over 50% of Australian cotton is being exported overseas to be made into products. Jasper is riding a carefully woven denim surfboard, which symbolises the finished products journey back across the ocean (as well as his local community in the Eastern Suburbs). Miss Sophie reflects….. the multiculturalism of the school. Miss Sophie reflects….. the cotton industry. Miss Sophie reflects….. Antonio Gaudi. Miss Sophie employs two very different stylistic approaches (indigenous artwork and the mosaics of Gaudi) and combines them together beautifully. The Aboriginal motifs tell the story of the local community and the school, the city, as well as the process of growing cotton. These are then overlaid with the striking mirror mosaic representing the flowing lines of water and the irrigation systems needed for cotton. The fountain flowing from the mosaics also links beautifully to the irrigation of cotton. She is bold, sophisticated, vibrant and truly unique.